There would be a lot of things to miss if John Ford’s My Darling Clementine were a silent movie—the relaxed drawl of Henry Fonda’s voice; the various instrumental renditions of the song that inspired the title, which can playful or sweet at different tempos; the effect of Ford’s decision to shoot the finale with minimal sound—but the film could be understood without it. First there’s Ford in Monument Valley, suggesting the majesty and drama of the American landscape. Then there’s Tombstone, a famed outpost whose lawlessness is expressed in eerie, dust-choked darkness. Inside the hotel and saloon, the lighting has some of the chiaroscuro effect of film noir, framing contentious relationships in canted angles and deep shadows, and intimate ones in caressing light. And finally, there’s sunup before the shootout at the OK Corral, quiet and beautiful and tense with dread, with not only justice hanging in the balance, but civilization, too. 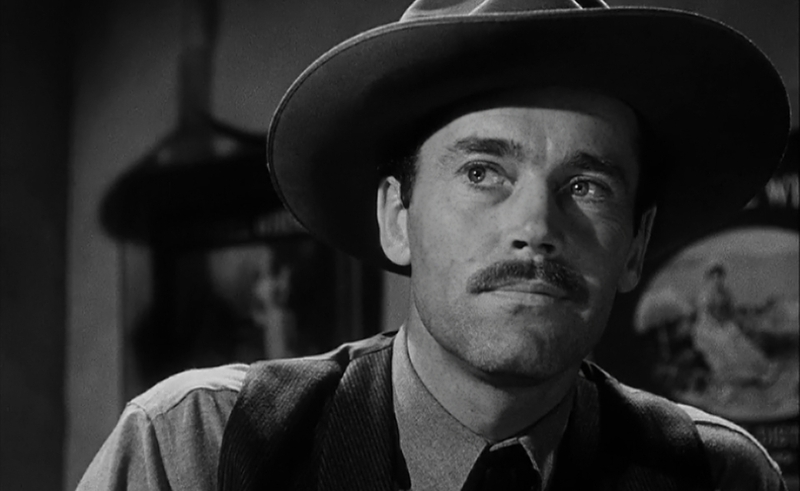 Ford the mythmaker was at the height of his powers in 1946’s My Darling Clementine, but it’s a remarkably relaxed and assured piece of work, as laid-back as Fonda idly tipping back his chair on the porch. It’s not just that Fonda is the right man to play Wyatt Earp, the reluctant lawman who brings order to Tombstone, but also that Ford seems to tailor the film to his star’s unique rhythms, which transform a lot of familiar Western action—shootouts and chase sequences, romantic rivalries and murderous vendettas, the virtuous and the violent—into something tonally new. Fonda’s Earp also carries a surprising amount of ambiguity, given the salt-of-the-earth decency that’s associated with him. His Earp stays in Tombstone for two reasons: To exact revenge on the men who murdered his brother, and to recast the town as a place where a man can get a simple shave without getting shot at. Those goals are not entirely compatible. In classic print-the-legend style, Ford manipulates or discards Earp’s story for his own purposes, starting from the very beginning, when Earp and his brothers pass through Monument Valley as cattle rustlers. After conversing with Old Man Clanton (Walter Brennan) and one of his scowling boys on the prairie, Earp is told about Tombstone and decides to head into town that night with two of his brothers, leaving the third to look after the cattle. When a drunk Native American starts shooting indiscriminately, Earp is the only man with the courage to take him down, but he turns down an offer to replace the town marshal who cravenly surrendered his badge. He has a change of heart, however, when he returns to the prairie to find his brother dead and the cattle stolen; he accepts the position, on the condition that his surviving brothers serve as his deputies. Other dramatic subplots surface, too, most notably Earp’s evolving relationship with Doc Holliday (Victor Mature), who has abandoned his practice and his woman (Cathy Downs) back East for a life in Tombstone as a hard-drinking gambler and saloon-keeper. (The life expectancy on such a dangerous trade is short, but Doc’s tuberculosis is shortening it anyway.) But the unsettling irony of My Darling Clementine is that Earp gets the badge as a cover for vigilante justice, and almost incidentally civilizes the place in the process. And perhaps that’s what Tombstone needs—not a White Hat or a Black Hat, but someone who can negotiate the moral gray area in between and deliver the town into the light. Though Ford proves that he can still deliver the wide-open action of 1939’s Stagecoach, My Darling Clementine puts a greater emphasis on interiors of both a literal and psychological kind. Earp and Holliday are tormented souls, and their partnership doesn’t make their lives any less complicated; when they step out together that fateful morning to confront the Clantons once and for all, the Clantons are just one piece of unsettled business. Ford engineers a sunny, satisfying denouement—though the studio fiddled with different endings and multiple cuts—but My Darling Clementine presages the troubled, arty flourishes of the anti-Westerns that would follow a couple decades later. Sam Peckinpah called it his favorite movie. They share genetic material. Of the abundance of extras on the disc, the most notable is the 103-minute “prerelease” version, which was discovered in the 1990s by film students who found themselves watching a print with significant differences from the 97-minute official release. The entire 103-minute cut is included here, plus a terrific comparison of the two versions by film preservationist Robert Gitt. Gitt reads from a memo to Ford from producer Darryl Zanuck, written after he viewed the first cut of My Darling Clementine. While Zanuck liked parts of it, he admits to not being satisfied with the movie overall and anticipating “a major and radical cutting job.” Zanuck followed through on that threat, ordering a lot of trims and reshoots, the most notable of which is the ending, which preview audiences considered too coy and withholding. Gitt cautions that the 103-minute version shouldn’t be thought of as a “director’s cut,” since it was issued a month after Ford had left the project. But as a transitional print, it preserves much more of Ford’s original visions for the film. Other features include a solid, accessible commentary by Joseph McBride, an academic who’s written two books on Ford and who gets into the director’s instincts for the simple and the mythical, as well as the impact World War II had on his sensibility. Another Ford scholar, Tag Gallagher, contributes a video essay that gets into Ford’s personal relationship with Earp and the combined “blarney” from both men that resulted in My Darling Clementine. In “Print The Legend,” Andrew C. Isenberg adds more evidence to the claim that Earp liked to burnish his own legend, though Earp’s real post-Tombstone adventures, including his time as a gambler and a prize-fight referee, are certainly fascinating enough without embellishment. The disc digs deeper still with TV segments on Tombstone and Monument Valley from a 1963 episode of David Brinkley’s Journal and a 1975 clip from the Today show, respectively. And rounding out the package is a silent 1916 Western short called “Bandit’s Wager” by Ford’s brother Francis, and a Lux Radio Theatre adaptation featuring Fonda and Downs reprising their roles.